WASHINGTON — Offering reassurances, President-elect Donald Trump’s pick for health secretary said Wednesday the new administration won’t “pull the rug out” from those covered by “Obamacare.” Democrats were unimpressed, noting a lack of specifics. Rep. Tom Price, R-Ga., also told the Senate Health, Education, Labor and Pensions Committee that Trump is “absolutely not” planning to launch an overhaul of Medicare as he tries to revamp coverage under President Barack Obama’s signature health care law. He acknowledged that high prescription drug costs are a problem, but did not endorse the idea of government directly negotiating prices. Throughout the nearly four-hour hearing, Democrats peppered Price with questions about his stock trades. The sometimes confusing exchanges involved different transactions under distinct circumstances. Price, who has signed a government ethics agreement to sell his stock, was clearly annoyed by the suggestion that he profited from his official position. “I’m offended by that insinuation,” he told Sen. Elizabeth Warren, D-Mass. Committee Chairman Lamar Alexander, R-Tenn., lauded Price’s performance, but ranking Democrat Patty Murray of Washington said she remains deeply concerned. No Democrats offered support for the 62-year-old nominee, an orthopedic surgeon-turned-legislator. Price said he wants to reopen a bipartisan dialogue on health care centered on practical solutions. Alexander said he took that to mean that the Trump administration will follow his advice and not attempt to repeal the 2010 health care law without a replacement ready to go. The Affordable Care Act is providing coverage to about 20 million people, and government as well as private experts say repealing without a concrete substitute would throw millions off their coverage and spike premiums. But Sen. Tim Kaine, D-Va., Hillary Clinton’s running mate, said, “I don’t think ‘lowering the temperature’ is consistent with rushing” to repeal and replace. Trump has promised to unveil a plan when Price is confirmed. With coverage for millions at stake, Price faced pointed questions about Trump’s evolving stance on health care. Trump campaigned on repealing Obama’s law, but at times he’s sounded more like a liberal. For example, he made recent comments about providing insurance for everyone and taking on the drug companies. In an interview aired Wednesday on Fox News Channel, Trump said his approach would offer coverage through private insurers for people who cannot afford it. “Nobody is going to be dying on the streets with a President Trump,” he said. He said his plan would “probably” turn Medicaid over to the states in the form of block grants to cover low-income people. Democrats reminded Price that approach could lock in big cuts. Price represents Atlanta’s northern suburbs and until recently led the House Budget Committee. A budget hawk and a social conservative, he drafted his own plan to replace Obama’s health law. It would have saved taxpayers money but covered fewer people, according to an outside analysis. Sen. Bernie Sanders, I-Vt., pressed Price on whether Trump intends to keep promises repeatedly made during the presidential campaign not to cut Social Security, Medicare and Medicaid. “I have no reason to believe he’s changed his position,” Price said. He expressed support for some provisions of the Obama health law, including allowing young adults to remain on parental coverage, protecting people with pre-existing medical conditions, and closing the Medicare prescription drug coverage gap. 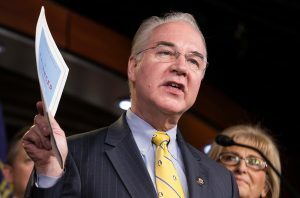 But pressed on whether he would support Trump’s call for Medicare to negotiate with drug companies, Price tried to sidestep. If confirmed, Trump would be his boss, Price said, but he also suggested the idea of negotiations needs further study. He was supportive of requiring drugmakers to provide more public information about how they set prices. Democrats also challenged Price on his extensive stock portfolio. His investments have prompted questions about potential conflicts of interest and calls for a Securities and Exchange Commission investigation of possible insider trading. Sen. Al Franken, D-Minn., suggested Price got a special deal in the purchase of stock in an Australian drug company, Innate Immunotherapeutics. But Price insisted other investors also had the same option. Republicans bristled at such questions. “To question whether you are honest is insulting,” Sen. Rand Paul, R-Ky., told Price. HELP is one of two Senate committees that will hold hearings on Price. The Finance Committee, which actually votes on reporting the nomination to the Senate floor, will conduct a hearing next week.